I have been so incredibly busy lately. 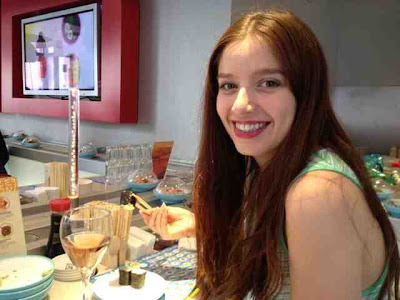 Decorating the new flat has taken all of my energy and time, but we did sneak away for champagne lunch at Yo Sushi! So delicious! What I wore, but you can't really see: Sea foam green, front racerback crop top from Zara and dark denim skinny jeans from Forever21. My new lipstick? Vicious Violet from Barry M.! So obsessed!